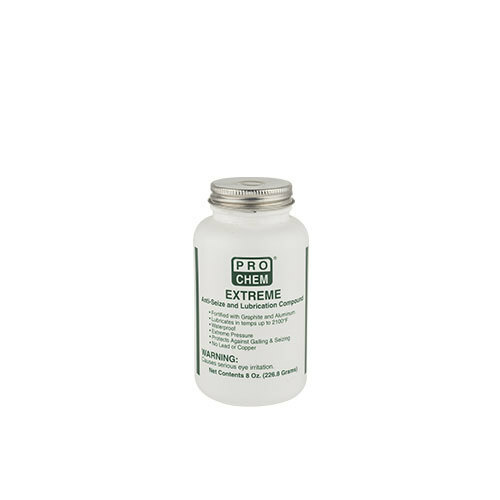 EXTREME | Pro Chem, Inc. EXTREME is a thick, metallic silver compound made from high VI olefinic copolymer fortified with graphite and aluminum to protect metal parts under extreme conditions of pressure and heat. It is formulated to help reduce seizure, corrosion, pitting and flushing over a long period of time for threaded fittings, gaskets, bushing, pumps, exhaust systems and furnaces. It has no dropping point, so it will not run out of threads when heated. It is a high temperature antifriction bearing lubricant that functions in high speed use to 450°F. From 600°F through 2100°F it functions as a dry film lubricant for heavy load and slow speed use such as in slides or slow revolution equipment. This product is appropriate for use as a lubricant with no food contact in official establishments operating under the Federal meat, poultry, shell egg grading, and egg products inspection programs. This compound may be used on equipment where there is no possible contact between edible products and lubricants or lubricated parts. Apply to surface with brush-top applicator.